Detailed review of Sukin Revitalizing Facial Scrub. See how it stacks up against other exfoliators! Overall, I gave this exfoliator 1 out of 5 stars. I was extremely disappointed with this one. The only thing this scrub had going for it was the price… and if you ask me there are far better exfoliators at a lower price point out there. After using this product, I saw no change in the appearance of my skin. Sukin Revitalizing Facial Scrub did a horrible job exfoliating my face. It actually left my skin feeling worse after use than it did prior! This scrub left my skin feeling waxy, which I absolutely HATE!!! I ended up having to rewash my face after using this product. I would recommend staying away from this exfoliator. This product is cream-colored scrub. You can see the small bamboo and walnut particles, which gives the scrub a sandy texture as you apply it to your face. I’m not a fan of the smell of this exfoliator. Although it’s fragrance free, it has a waxy, crayon like smell to it. It is not extremely strong or overpowering, just unpleasant. The application of this is exfoliator isn’t as easy as it sounds. To use this exfoliator: apply a small amount to fingertips. In a circular motion, massage onto face and neck. Rinse well with warm water. It doesn’t specify how often this exfoliator should be applied. I found it very gentle so you could probably use it 3-4 times a week. Although, I don’t see why you would want to. The instructions say to “rinse well with warm water.” This is definitely an understatement. I had to rub and scrub and the product still wouldn’t come off my skin. I found it impossible to completely rinse the product off. I tried rinsing my face off multiple times with warm water and could not get rid of the waxy residue it left of my skin. I eventually had to re-wash my face with my daily face wash to remove it. What a pain! This product is extremely gentle. I didn’t experience any drying or redness after use. I was disappointed with the results, or lack thereof, I saw from this exfoliator. Besides leaving my skin with a waxy feel, this exfoliator didn’t do anything for me. Any areas of dry skin I had prior to use where still there after using this product. The only thing this scrub did was leave a waxy residue on my face. The key ingredients in this exfoliator are bamboo extract and ground walnut shells. Bamboo extract is rich in silica, which helps the skin absorb essential minerals, improving the overall health of your skin. Bamboo extract also includes many anti-oxidants, which are said to help minimize fine line and wrinkles. Ground walnut shells are becoming an increasingly popular exfoliating agent due to their organic nature and ability to remove the face’s surface layer of dead skin cells. 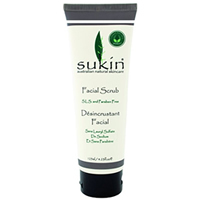 Sukin Revitalizing Facial Scrub costs $14.99, which is very inexpensive for an exfoliator. However, I was not a fan of this one. I would recommend spending that money on a different product. To buy Sukin Revitalizing Facial Scrub, click here.